This week has felt like the longest week in the history of weeks. I may have to do away with this rule soon. I have so many awesome things to share today. 1. Our wood floors are FINISHED! The outcome? Now, I want wood floors in our whole house and not just downstairs. Love 'em. 2. I am all kinds of teeny bopper OBSESSED with this video, "Call Me Maybe" featuring Justin Bieber, Selena Gomez, and Ashley Tisdale. Tell me you've seen it? I've even gone as far to download this song. 5. Please look at part of Billy's side of the closet and part of my side of the closet. ...and cheer on my Buckeyes!!!!!! *PS-Want to see a Kentucky CATS fan cheering on OSU? Go HERE for that awesomeness. Oh my gosh that closet picture is too funny! What a cool pitcher for water! Go Buckeyes :) I'll definitely be watching (and shaking) too! Ya know...Organic coffee has TONS of antioxidants. I totally understand cutting back on caffeine though (I gather that's what your doing?) I limit myself to one cup a day. On weekends I'll have 1 1/2 cups, and I don't have any other form of caffeine (occasionally green tea). I think your all right. :) ANyway, if your looking for a nudge in that direction hopefully I provided it! Oh, and HELLO Jodi! I have that water infuser pitcher too, Katie. I did a whole blog post on infused water back in the day. love that pitcher! i think i need to go get me one! ME and Kendall may or may not have just danced around the house to that song, so cute ! and when it was over KP said "mooooore"
Your floors look gorgeoussss- I'm wanting hardwood floors in our whole house too, I just love them! 1. Your floors look fabulous. Love that dark wood! 2. I need that pitcher. Where can I buy it? The floors look AMAZING!! I love home upgrades that make you so excited about your house all over again! I WANT that water diffuser!! I cannot get enough of that video/song. I'm fairly certain my coworkers think I'm a crazy person cause it's impossible not to dance when it's on! For the first time in my life...as an avid kentucky fan, I will admit that I am rooting for the buckeyes...because if they make it to the final game (to get beat by ky, of course...lol)...I will win my office pool, so go BUCKEYES! 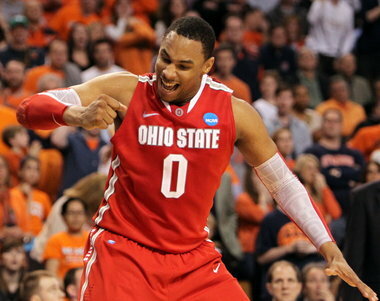 WOOO HOOO GO BUCKS! and I think I am going to need to get one of those pitchers :) Love cucumber water! loving the floors! and the closet picture...hilarious! Jodi's story is so inspiring! Thanks for giving her the chance to share! OMG that video was so freaking cute! how fun! i love seeing celebs act normal...that was too cute! thanks for sharing! I am pretty embarrassed by how much I have listened to this song over the past few weeks too. And yes, I too fell in love with Ashley Tisdale after watching this video. hahaha you SET ME UP!!!! :) I love you and cannot wait to see you in a couple months!! What is this girl above me talking about KANSAS!!!?? I swear I have a feeling that it's going to come down to UK and OSU!! LOVING the new Ashley Tisdale song, totally reminds me of high school! You have me officially obessed with that video now. I have never even heard that song before...Ya I have entered the twilight zone..
Look at target getting all fancy on us! that looks so cool! and your words floors are AMAZE!!! hope you had an awesome weekend friend!